The Times follows the latest deployment of HMS Montrose, which has recently been at work throughout the Pacific, visiting Singapore, Japan and Australia. The paper suggests that the deployment is part of a new commitment by the UK Armed Forces to set their sights "east of Suez" and support the UK's economic and political interests in the region. As reported in The Times, during her deployment Montrose has "chased drug-smugglers in the Caribbean, North Korean sanctions-busters off China, and navigated the tense waters of the South China Sea." Commander Conor O'Neill, the ship's captain, spoke to The Times about the varied nature of the ship's work. He said: "One day we can be exercising at sea, a day later we can be taking part in a royal visit and a major diplomatic event. "The UK has always aspired to be a global player, punching above our weight. If you say that you are a global navy, then you have to turn up occasionally." Defence Secretary Gavin Williamson has previously spoken about his commitment to the region, saying: "We're determined to keep standing up for what's right." 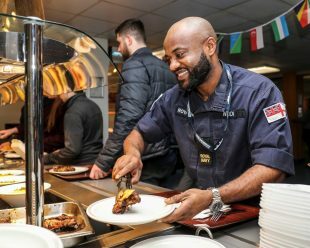 Personnel at HMS Nelson share jerk chicken, rosti and Australian-themed burgers in celebration of Commonwealth Day.